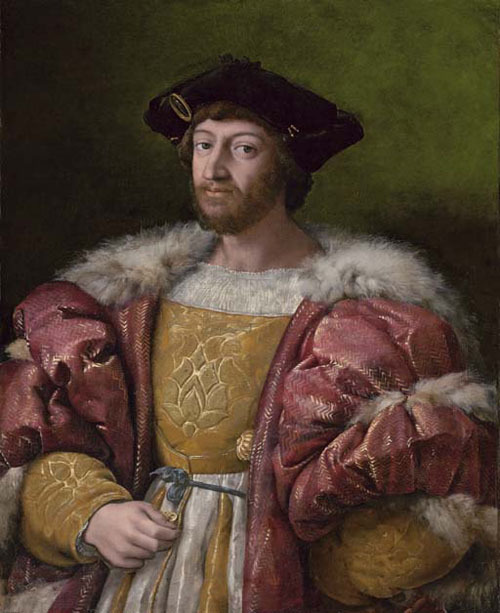 The portrait of Lorenzo de’Medici, Duke of Urbino (1492-1519), coming up for sale at Christie’s on the 5th of July is an interesting case study in the perpetual problem in art history of reconciling visual and textual evidence. I have just visited Christie’s in London and examined the painting. It is obviously a severely damaged, extensively restored painting, but it is still quite beautiful. To me it looks like it was substantially painted by Raphael himself, but things are unfortunately not so easy. The auction house, hardly unbiased, unequivocally hails it as an autograph work, claiming that the attribution has been ‘conclusively’ established by Konrad Oberhuber in an article of 1971. However, as several dissenting scholars have pointed out, there are obvious problems with the documentation of the picture. That Raphael painted a portrait of Lorenzo in late January 1518 is documented so well that we can determine the date of its creation with a couple of weeks’ precision (20 January – 10 February). This portrait was taken to the French court as part of marriage negotiations between Lorenzo and Madeleine de la Tour d’Auvergne, the cousin of Francois I. The wedding took place in Amboise on 2 May that same year. The portrait then in all likelihood returned to Urbino along with the Duke. The couple both died the following year, and the Medicis lost control of Urbino in 1521, but the finest possessions of the new Duke Francesco Maria della Rovere, presumably including the portrait, were eventually transferred to Florence as part of a matrimonial agreement. Which brings us to the stated provenance of the picture at Christie’s. Several Medici inventories through the 16th Century mention pictures that could be identified as the present one. The problem, brought to wider attention by James Beck in an article of 1975, is that the second inventory to mention the picture, from 1560, describes it as ‘large’. Beck argued that this cannot possibly apply to the present picture, as it is markedly smaller than any of the other identifiable, extant pictures given this designation in the inventory. He furthermore pointed to a portrait of Lorenzo in the Medici-Riccardi Palace in Florence, painted around 1586 by Alessandro del Barbiere, which is three-quarter length and fits the criteria for ‘large’ as he deduces them from the inventory. The reasoning is that this picture is a copy of the original portrait, which is the one recorded in the 1560 inventory, was fully three-quarter length and is now lost. 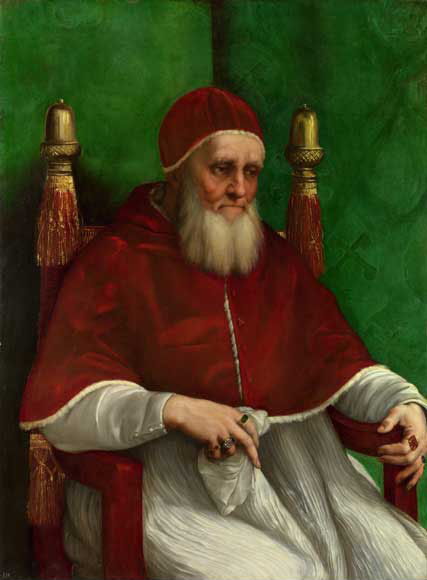 This would mean that the picture at Christie’s must be a reduced replica, produced in Raphael’s workshop around the time the original was painted (a common practice at the time, especially when it came to portraits of important dignitaries. Inventories through the 16th and 17th Centuries list several pictures that could be either replicas or later copies of the original portrait of Lorenzo, and a number copies of the present picture are still extant today). However, if the picture at Christie’s is a replica, it is of a very high quality and was -– as mentioned initially -– probably substantially executed by Raphael himself. The sumptuous handling of the fabrics, with the patterns on the sleeve and dublet -– the best-preserved areas of the painting –- drawn, in gold and blue-grey respectively, loosely on top of richly built-up areas of relatively impastoed colour merged with aqueous glazing, recall similar areas in the 1511 portrait of Julius II in the National Gallery, which I went to compare with after having seen the picture at Christie’s. The portrait of Lorenzo does not equal the Julius in subtlety, but the execution is still of comparable quality, as the wonderfully evocative, puffy areas of fur also attest to. It is true that the Lorenzo has rather weak areas that do not live up to Raphael’s best portraits –- mainly the rather flat, non-descript face and the slightly awkwardly rendered, similarly flat right hand of the sitter. However, these are the two areas the most extensively restored, as both the x-ray photograph published by Oberhuber and the UV lamp that the Christie’s people kindly let me use reveal. The left-hand side of the face and the lower part of the right hand in fact consist almost entirely of new layers of paint. 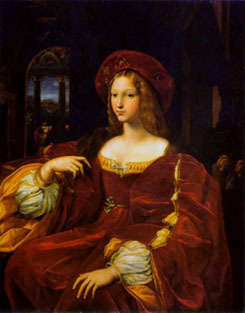 As Oberhuber argued, the comparatively bland expression of the sitter most likely has to do with the French-influenced reconfiguration of type of state portrait Raphael was effecting here; contrary to his picture of Julius, he was not trying to depict an individual as much as an aristocratic position with this portrait. That being said, the picture is not devoid of personality. And there are clear similarities between the gentle expression on Lorenzo’s face here and that in the face of the so-called ‘Fencing Master’ in the famous double portrait in the Louvre (c. 1518-19). Though again not the equal of that portrait, Lorenzo is here rendered with a sensitivity worthy of Raphael’s. Given these qualities, I find it hard to accept full attribution to the studio. Giulio Romano, who painted the impressive, but slick and depersonalized Louvre Joanna of Aragon at the exact same time, also for dispatch to the court of Francois I, brings a cooler, harder finish to his pictures. And Gianfrancesco Penni, to whom John Shearman has attributed the picture, has to my knowledge never demonstrated as subtle an understanding of characterisation or as full a grasp of volume as is on display here. It is however likely that either of them, or other assistants, were to some extent involved, as they were in most of the paintings of the last few years of Raphael’s life (he died in 1520). All that aside, however, the essential problem posed here is determining whether the picture is the original, documented painting, as is claimed by Christie’s. Several aspects of it speak for it. 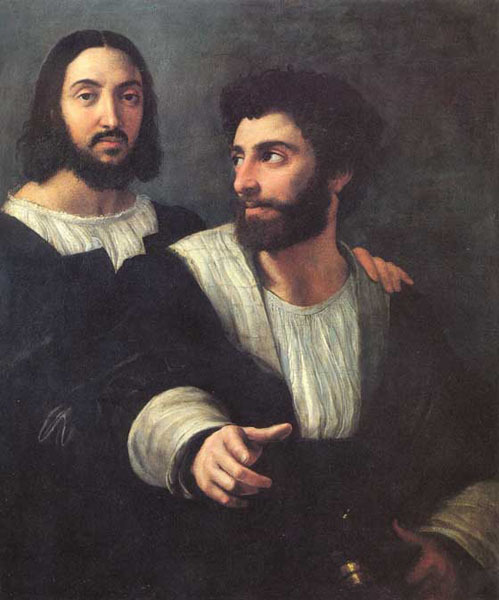 It is on high-quality canvas, a support Raphael only used rarely, but might have chosen in this case because the commission required expediency, and perhaps also because he knew the painting would have to be dispatched to France and canvas travels easier (Giulio’s Joanna, which traveled with the original Lorenzo, is, however, on panel). Given the preference for panel in the studio, wood would likely have been the support for any replicas produced concurrently. Most importantly, however, is the fact that the painting does not exhibit the characteristics of a replica. It is unevenly painted, with several pentimenti (overpaintings, normally the result of corrections), which is rare in work copied from a finished source. It is, for example, visible to the naked eye that the left side of the hat has been corrected, and the x-ray shows that it was initially extended upwards. Furthermore, the right hand exhibits several corrections: the x-ray shows that the thumb and index fingers have both been extended to meet each other, and to cover the cord that runs from the dublet. Also, the double contour along the lower part of the hand is evidence that it was moved upwards. Beneath the hand, to the immediate left of the aforementioned cord, what appears to be a pentimento is also visible to the naked eye. What exactly it stems from is hard to tell, however, even when looking at the x-ray. Beck, who was unfortunately denied access to the painting and thus had to rely on (black and white?) photographs, argued that the corrections on the hand could just as well stem from problems in properly copying it on the part of the copyist, which is not implausible, and I guess that the other pentimenti mentioned could be the result of later overpainting, though I could not detect any when examining the area with the UV lamp. On the balance, however, I would say that these aspects of the painting, coupled with its general quality as outlined above speak in favour of it being the original portrait. The natural way of squaring this with the documents would be that the canvas was cut down to its present size at quite an early stage of its life, after 1560. This would explain the description of it as ‘large’ in the 1560 inventory, and also makes pictorial sense: it would account for the slightly abrupt framing of the lower part of the painting, where the left hand, placed against the hip, is barely visible. It would be logical to assume that the painter would leave more space for such a detail. Also, the lower part of the painting is the most abraded part of the entire canvas, which could be due to a reduction having been effected. Oberhuber however writes, rather vaguely, that “There seems to be no reason to assume the picture has been cut.” But since he does not elaborate and leaves his formulation open, it is not unreasonable to doubt this statement. Disregarding the problem of Oberhuber’s statement and its basis, the posited reduction would most likely fall after 1609, as an inventory of the Palazzo Vecchio in Florence of of that year lists a large portrait of Lorenzo on canvas. Its size is given as three by two braccia (c. 175 x 117 cm. ), ‘large’ in other words. This canvas has — by Beck amongst others — been taken to be the alleged original, now lost version, and thus also the prototype of the already mentioned three-quarter length Barbieri panel in Florence, which is securely datable to around 1586. However, if the present canvas was originally larger, it could easily have been the prototype of the Barbieri copy as well as the work listed in the Palazzo Vecchio in 1609. (There is in the Uffizi another copy, of smaller size than the present canvas, ascribed to the studio of Cristoforo (/Cristofano) dell’Altissimo, who died in 1605. This, however, is obviously an adaptation to a smaller format and thus poses no problem in the present context). And let’s not forget that the description of the canvas in the 1560 inventory as ‘large’ could, in the first place, be a mistake of some sort, or merely an inconsistency. One should naturally be very careful about accepting such speculative hypotheses in favour of one’s own argument, but it is not entirely outside the realm of possibility. Texts can lie or be ambiguous just as images can. We art historians have a problematic tendency to trust written documentation much more willingly than visual evidence, and in this we are extensions of our society. We trust text and distrust images. There is plenty of visual evidence that the picture at Christie’s is an original composition and that Raphael was involved in its execution, and I cannot see how one innocuous word –- ‘large’ –- in an inventory, or a vague remark by Oberhuber in a footnote stating that it was probably not cut down, should make me renounce what my eyes (aided somewhat by x-ray photography and UV light) are clearly seeing. The painting goes on sale July 5, and will be on display at Christie’s, King Street, London from the June 30. For an account of its provenance and a full bibliography, check the lot entry at the Christie’s website. For a discussion of the sources, including a complete survey of those inventories as they pertain to the picture see Konrad Oberhuber, “Raphael and the State Portrait – II: The portrait of Lorenzo de’Medici, in: The Burlington Magazine, no. 821, vol. CXIII, Aug. 1971, pp. 436-443 (also includes the x-ray of the picture) and James Beck, “Raphael and Medici “State Portraits”, in: Zeitschrift für Kunstgeschichte, vol. 38, 1975, pp. 127-144 (also reproduces the Barbieri copy). Depicted here, along with the Lorenzo, is Raphael, Portrait of Julius II, 1511, oil on panel, 108.7 x 81 cm., London, National Gallery, Raphael, Self-Portrait of Raphael with a Friend (the so-called ‘Fencing Master’), c. 1518-19, oil on panel, 99 x 83 cm., Paris, Louvre, and Studio of Raphael (Giulio Romano), Portrait of Joanna of Aragon, 1518, oil on panel, Paris, Louvre.